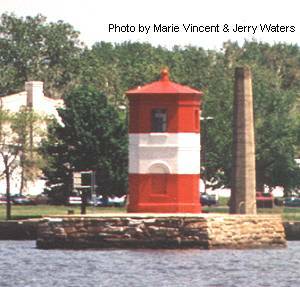 Craighill Channel Upper Range Front Lighthouse – Chesapeake Chapter U.S.L.H.S. Craighill Channel Upper Range Light Front (Cutoff Channel Range Front, Ft. Howard) was built on the foundation of the old North Point Light. It is a small red and white brick octagonal tower. The original keeper’s quarters were located on shore with a wooden bridge connecting the light to the shore. After the bridge was destroyed in 1893 the keeper was moved into the less than twelve-foot square lighthouse. The light was moved outside the lighthouse in order to make more room for the keeper. A small skiff was his means of getting ashore. The light was automated in 1929. Located just off North Point in Fort Howard. Accessible only by boat, but there are excellent views from the Fort Howard VA Medical Center. Site and tower closed to public.